The RS Pro 776-0967 is a pack of 250 warning symbol labels. These vinyl stickers measure 50 x 50 mm and are yellow and black printed on a white background. The 776-0967 labels are designed to prevent serious electrical injury from machinery and other electronical equipment by warning the user of the high voltage. When displaying important messages, its important to ensure they are visible. This particular label should be stuck in a prominent place to ensure effectiveness. For example, you may place it on the particular piece of machinery or next to the relevant plug/socket. Vinyl is more durable than traditional paper labels. Vinyl is stronger and will not crack or fade over time like paper. Also, if you decide to remove a vinyl sticker, it will come away in one piece. Vinyl also has a much better appearance with more vibrant colours and a coating to protect against water, sun and oil. ISO 7010 is an international standard which ensures consistency across different hazard and safety signs. The combination of colours and symbols is designed to be easily understandable, without reliance upon too much wording. Danger To indicate an imminently hazardous situation which, if not avoided, will result in death or serious injury. Note: To be limited to the most extreme situations. Warning To indicate a potentially hazardous situation which, if not avoided, could result in death or serious injury. Caution To indicate a potentially hazardous situation which, if not avoided, may result in minor or moderate injury. 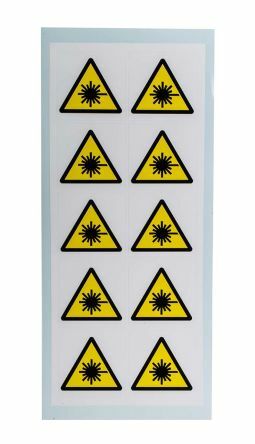 Self-adhesive warning labels for use on products containing lasers.Yellow vinyl with print and an acrylic adhesive, overlaminated with a clear, shiny polyester coating. H.52mm, W.105mm. 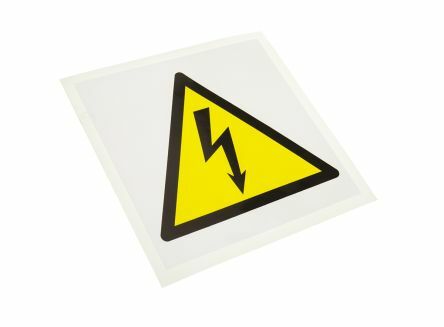 Self-adhesive warning labels for use on products containing lasers.Yellow vinyl with print and an acrylic adhesive, overlaminated with a clear, shiny polyester coating. Durable finishH.52mm, W.52mm. 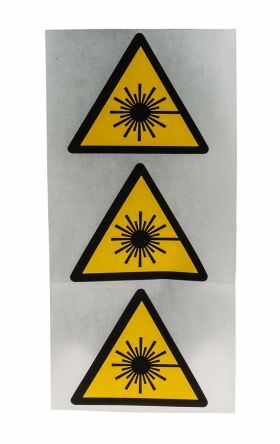 Self-adhesive warning labels for use on products containing lasers.Yellow vinyl with print and an acrylic adhesive, overlaminated with a clear, shiny polyester coating. Durable finishMaterial: Self-Adhesive vinyl50 x 50mm.